Terms 2-way and 3-way indicate the number of drivers that are present in a speaker. Each driver is responsible for producing a different range of frequencies. It’s might sound simple, but there is a lot going on behind the scenes. The more drivers you have the more complicated it becomes to create a speaker that reproduces sound in a proper way. Let’s take a look at the differences between these configurations and find out which one should you choose. Why not use 1-way speakers? First, let’s answer the question: “Why not use only 1 driver speaker” instead of 2 or 3? It seems quite obvious that we wouldn’t have many problems with crossovers and the whole construction would be much simpler. 1-way speakers are often used in computer speakers. But this kind of speaker has obvious limitations. It does bass, it does mids, and it does treble, but it can’t do anything really well. And this is the compromise involved here. The reason why you want to use more than 1 driver in a speaker is that the speakers of different sizes are best suited to handle different ranges of frequencies. For example, low frequencies (bass) require large air movement. On the other hand, if you want to produce high tones (treble), you need fast air movement. To produce a high-quality bass you should use large drivers (woofers) and for high-quality treble, choose small drivers (tweeters), which are usually in a shape of a dome. A 2-way, as the name suggests is a speaker with 2 drivers. One of them is responsible for low frequencies (woofer) and the other one for high frequencies (tweeter). This type of configuration is very popular. You can find it in hi-fi systems or bookshelf speakers. But you can use a larger 8-inch woofer to have better bass. This can be a good idea because the price of a 6.5-inch woofer is similar to an 8-inch woofer. The disadvantage of this approach is that speaker becomes less compact. But you don’t want to go beyond that. Because there is no a driver in the middle the woofer have to do not only low frequencies but also the mids. If the woofer is too big you will have a hole in mid frequencies. If you want a woofer that is 10-inch or larger you should consider creating a 3-way system. The difference between 2-way and 3-way system is that in the latter you have an additional driver. This driver is responsible for producing midrange frequencies. In practice, it means that a woofer can be larger than 10 inches and therefore it will be better in reproducing low tones because the mid frequencies are taken care of by an additional mid driver. 10 – 12 inch driver / 5.5 midrange driver / tweeter. It’s easier to have a 2-way system sound good, but with time, money and knowledge you can achieve spectacular results with a 3-way. 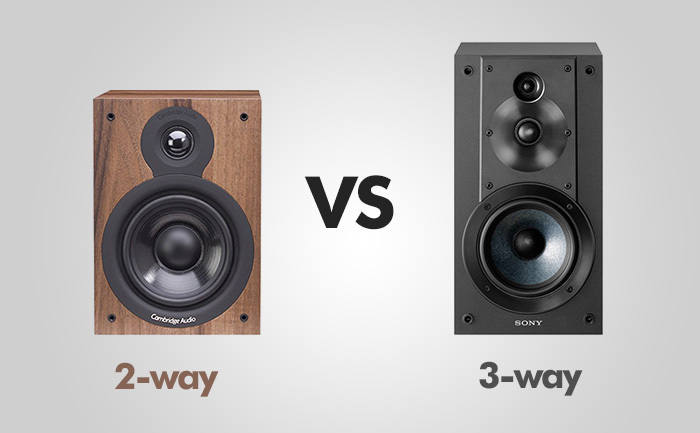 So, 3-way speakers are better than 2-way, right? It seems reasonable that splitting the job between three speakers is better than two. But the answer is a bit more complicated. There are a few additional factors that are important than just the number of drivers, such as quality of components, design or how well the crossover is set up. So you can find great (and expensive) 2-way speakers and some mediocre 3-way. But in general, 3-way are more expensive, because there are more drivers and setting two crossovers is more complicated than just one. If your speaker has at least 2 drivers, the frequencies have to be split between them. So if you have a 2-way speaker you have one crossover, if you have 3-way, you have 2 crossovers, etc. In order to get good sound from the overlapping frequencies, all crossover must be finely tuned to contribute the exact amount of output. If there is too much or too little combined output you will get a distorted sound. There are two types of crossovers: passive and active. They are called passive because they don’t require any kind of external power source. They are powered by the audio signal that streams through it. Active crossovers can adjust to the changing frequency levels and are less popular and more expensive than passive crossovers. Although you can find 2-way speakers that cost thousands of dollars, and you can also find a mediocre 3-way speaker. But 3-way is usually more expensive. If you have a 2-way and 3-way for the same price, the 3-way must be using overall cheaper drivers, since it has more of them. In such case, they probably use low-quality materials that will affect the sound quality. The second reason for the higher price is that there is much more work and knowledge involved when you have to deal with more than one crossover. A 4-way speaker is similar to 3-way with the addition of a tweeter responsible for very high frequencies. It has an additional driver, called super-tweeter. It is responsible for producing ultra-high frequencies. So you have a woofer, midrange, tweeter, and super-tweeter. But it can also come in different configurations. woofer, midwoofer, midrange, tweeter, and super-tweeter, but other configurations are also possible. This, in theory, should give us an even wider range and clearer sound, but it can also be a way to raise the price and make money on people that don’t know much about speakers. PROS: For reasonable money, a 2-way will probably sound better than a 3-way. PROS: A separate mid-range driver can reduce midrange distortion. But of course, it all comes to implementing crossover that split frequencies into three bands. CONS: If there is a lot of bass, a 2-way speaker stop producing accurate midrange. So if I want to listen to a bass-heavy music, you should go with a 3-way speaker. CONS: The crossover is hard to configure. Cost is higher.